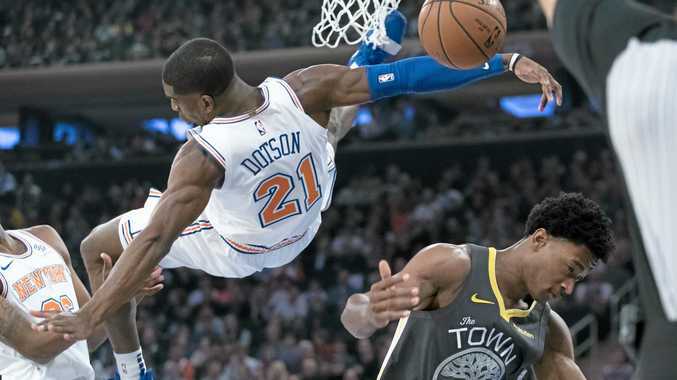 KEVIN Durant scored 25 of his game-high 41 points in the fourth quarter as NBA champions Golden State ended the game on a 39-9 run to overwhelm the Knicks in New York. The back-to-back champions have now won five of six to open the season after finishing off strong at Madison Square Garden to triumph 128-100 on Friday (local time). Stephen Curry scored 29 points for Golden State, with Draymond Green contributing 18 and Klay Thompson 12. The Knicks have lost five straight since a season-opening win, though they have fallen to contenders Golden State, Boston and Milwaukee. Tim Hardaway Jr led New York with 24 points. In Toronto, Kyle Lowry had 20 points and 12 assists for a fourth straight double-double as the Raptors defeated a visiting Dallas 116-107. Kawhi Leonard also notched 21 points and grabbed nine rebounds for the Raptors, who have won their first six for the first time in franchise history. Luka Doncic scored 22 points for the Mavericks, who have lost two in a row. Charlotte tied a two-game back-to-back run against visiting Chicago with an easy 135-106 victory. Kemba Walker nailed 30 points and also got close to his first triple-double of the season with six rebounds and seven assists in just 26 minutes. Zach LaVine, who came into the game third in the NBA in scoring at 32.3 points per game, led the Bulls with 20. The Clippers' Montrezl Harrell scored a career-high 30 points and Lou Williams chipped in 23 as the visitors beat Houston 133-113. Los Angeles thrived on offence against a Rockets side without James Harden and James Ennis. Carmelo Anthony paced the Rockets with a season-high 24 points. Giannis Antetokounmpo had 15 points and 12 rebounds in just 23 minutes, Ersan Ilyasova added 16 points off the bench as Milwaukee beat Minnesota 125-95. Khris Middleton scored 16 points and hit four three-pointers for the Bucks, who are 5-0 for the second time in franchise history. Jrue Holiday scored five of his game-high 26 points in the final 22 seconds as host New Orleans rallied against Brooklyn to stay undefeated. Holiday, who was coming off a two-for-15 shooting performance, made two free throws to pull the Pelicans within 115-114 with 21.9 seconds left. With the shot clock off, New Orleans didn't foul and D'Angelo Russell threw out of bounds with 7.5 seconds remaining. Russell led Brooklyn with 24 points, Caris LeVert scored 21 and Shabazz Napier 16. Buddy Hield scored seven of his 22 points in the final 6:18 as Sacramento took advantage of three late Washington turnovers to hold on 116-112. Hield made three of four free throws in the final 19.6 seconds, De'Aaron Fox one of two with 2.4 seconds left and Nemanja Bjelica a pair with 1.8 seconds to go.